Animal Liberation: A New Ethics for Our Treatment of Animals. New York: Random House, 1975. First edition of Singer’s landmark work. Octavo, original cloth. Presentation copy, inscribed by Peter Singer on the title page. Small name to the front free endpaper, near fine in a near fine dust jacket. Jacket design by Janet Halverson. Australian moral philosopher Peter Singer is a frequent advocate of animal ethics, which he teaches on at Princeton University. Animal Liberation "galvanised a generation into action. 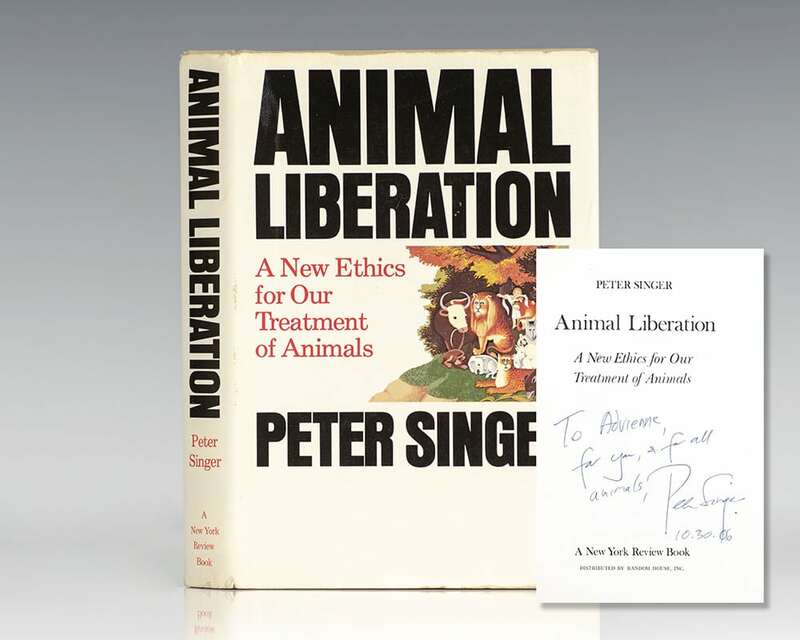 Groups sprang up around the world, equipped with a new vocabulary, a new set of ethics and a new sense of mission...Singer's book is widely known as the bible of the animal liberation movement" (Independent on Sunday). It is "[a] reasoned plea for the humane treatment of animals that galvanised the animal-rights movement the way the Rachel Carson's Silent Spring drew activists to environmentalism" (New York Times). And it is "[i]mportant and responsible...Everyone ought to read it" (Richard Adams). It is "[p]robably the single most influential document in the history of recent movements concerned with animal welfare" (Guardian). First British edition of Singer’s landmark book. Octavo, original cloth. Lengthily signed by the author on the half-title page as follows, “All the arguments to prove man’s superiority cannot shatter this fact: In suffering the animals are equal. Peter Singer.” Fine in a near fine dust jacket. Jacket design by Mon Mohan. The Most Good You Can Do: How Effective Altruism Is Changing Ideas About Living Ethically. New Haven and London: Yale University Press, 2015. 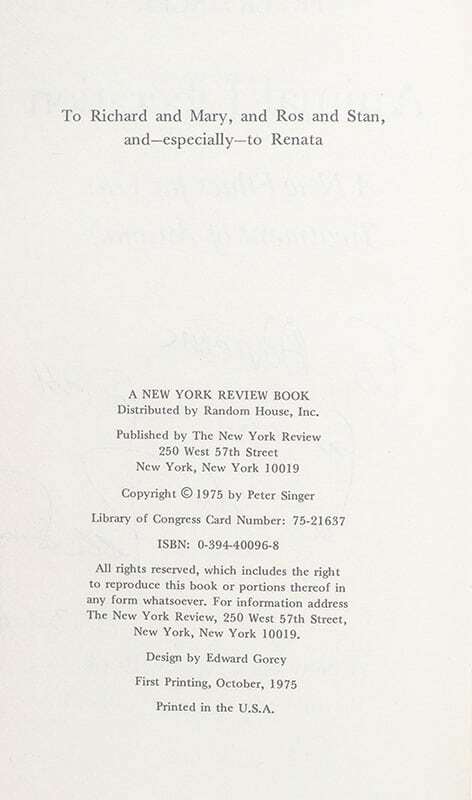 First edition of moral philosopher Peter Singer’s introduction to living altruistically. Octavo, original boards. Inscribed by the author on the front free endpaper, “To Aaron, Good luck in explaining the philosophical issues in effective altruism. Peter Singer 4.12.15.” Fine in a fine dust jacket.